That turn is just circumnavigating the roundabout at South Grove. Before there were roadworks to improve the infrastructure; the roundbout was smaller with a small gap in-between South Grove & Markhouse Road where buses used to stand (unofficially). I've seen more 58s stand there than 158s in the years I used to frequent St James Street in particular but I'm getting off topic. 158 from Chingford Mount: terminate at St James Street station; ahead St James Street, circumnavigate to St James Street to line of route. 158 from Stratford: terminate at Markhouse Avenue stop; ahead Markhouse Road, circumnavigate to Markhouse Road to line of route. Buses in either direction are not allowed to go to the bus forecourt for the 212 and 275; I assume due to the bad traffic on the lead up to Selborne Road. NB: Just wanted to state that under Stagecoach, the 230 was able to stand at Walthamstow, South Grove (that was the display until T won the 275). Under Arriva, the stand nor curtailment point is given; though it would be silly by both TfL & Arriva to not have St James Street on the blinds for the 230. Regarding the 230 I don't think it is silly. There is really no point a 230 curtailing to St James Street when Walthamstow Central a key location where most people are going is a few stops down the road. Probably it was removed for that very reason and that TFL want the Bus Station to be served at the very least if a turn was used alternatively Whipps Cross is also a turn. It also being High Frequency a Walthamstow Central turn could benefit in some situations. When Stagecoach ran it West Green was probably the most common turn. I agree with you over South Grove. It was a useful turn at times when there were various road disruptions. I am not sure if it is on the blinds, no doubt it would be an official turn, but guess it would not be used as it would wipe out the Walthamstow Central QSI point with the 4 stop rule. I was thinking about the QSI rule when reading DT 11's response. However as you've eluded to; if traffic was diabolical on Selborne Road/Walthamstow Central then (under Stagecoach) the South Grove turn came out. Obviously to avoid the disruption in the direction of Upper Walthamstow but also to make up on lost mileage when heading to Wood Green. Then the Tridents would pop down Markhouse Road & Lea Bridge Road to T.
We're heading in the past here but I am sharing my knowledge for Alex's benefit. Cheers but I've always had the intention of not making this too east-London centric! If I'm correct you're a PD driver; what's the most interesting route you've driven in terms of turns available? I've always imagined despite (or thanks to?!) the traffic on the 177, it does pull out some lovely turns. East Greenwich, Woolwich Monk Street and Thamesmead look like good places to stand. Monk Street is an awful stand - it's where the 96's sit. Stinks of wee - so when I do 96's, I usually stand outside Pound Land instead. Unless the traffic is completely diabolical, it's actually quite unusual to get turned on 177 as there is around 20 minutes at each end to allow you to get back out on time. Thamesmead is, well, Thamesmead The boiler house turn there is only a turn. There is a stand a short way away, which is ideal to take your five minutes, but that's it. If you get a turn on 177, I've found it's been towards Peckham and at NX Sainsbury mostly - or if it's coming back the other way and you're running extremely late, they'll run you light to PD once you've got to TM. 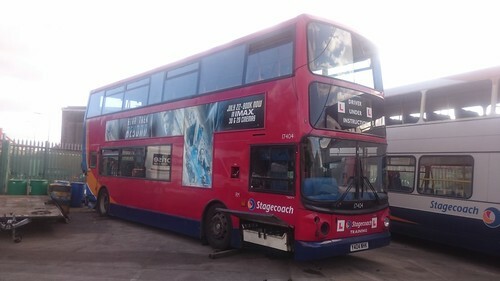 As an aside, 17404 (which is the first bus I ever drove in my life), is now wrecked in a yard in Hull somewhere. Not my picture btw. The brakes on that thing were bloody awful. Is the Beresford Street stand any better?! Every time I come to Woolwich via the foot tunnel, I see the 51s, 99s and 380s stand on the main road; which I don't find ideal. If there's any problem to the road network and/or ferry services, then it gets chocka & hard for all routes to depart the stand. IIRC the 96 had its stands switched to Monk Street for similar reasoning. Oh no to all of that really. Such a shame to hear that when still in London it didn't seem the best looked after, and why would it go to Hull to get wrecked? 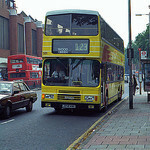 Do old London buses go to the provinces to provide spare parts etc for the fleet out there? Beresford Street isn't too bad. At least shops and cafe are in walking distance when you have to take your break down there. If it is chocka, thankfully the 51 stand is only about 75 yards away from where you have to turn left, so using a bit of common sense and departing the stand a couple of minutes early, you're usually ok. it's getting to the stand that can make you late sometimes. I've been early at Iceland, the last stop on 51's, but by the time I've got to the stand, it's been time to go, and faced with the choice of leaving on time by going straight through, or taking the full five minutes and getting out late. it depends on if it's school kicking out time which generally decides what I do in that situation. Nowt worse than having a double road in front of you when you have to pick up school kids. Do you normally take your break there? I had assumed all PD drivers returned to base? The layout at the junction has been changed in recent years as have the stop locations and the routes serving them. I suspect when you were driving you stopped at entirely the right stop which allowed a more convenient interchange. Now we just have a load of old rubbish with stops far too far apart. Chucking people off at Pymmes Rd is ridiculous. Even the stop east of Green Lanes towards Silver St is much further on that it used to be meaning you can easily miss a bus if changing off a 329. You have to be a sprinter to get to the stop if a 34 or 102 is due to come across the junction heading east. In the past you just stuck your hand out as the stop was just round the corner.